- Be everywhere & always the champion of right & good against injustice. - Never recoil before the enemy. - Love the country in which thou wast born. - Never lie, rather always remain faithful to thy pledged word. - Perform scrupulously thy feudal duties. - Never gainsay the weak, rather constitute thyself as defender of them. Max Wright stood under the archway leading to the Great Hall, knees knocking and sweating like a steamed clam in his brand new coat of mail. Yet his mind buzzed only with those words swimming in his head: The Code of Chivalrous Conduct. He dare not botch the oath at this Accolade, in front of such a large audience. Sir Affirmare handed him a kerchief. “Soak up some of that sweat 'Sir' Max, else the whole court will think His Majesty is dubbing a wet-nosed pup into his service.” The handsome knight towering over the boy unsheathed such a gleaming sincere grin, the young squire couldn't help but crack a smile of his own. It brought to mind the very first time he heard that expression. He was ten. It had been four years since mama reluctantly allowed him to leave the farmstead and serve as page in the liege lord's estate. Now, after endless months of stewardship and 'By-your-leaves', he was of age to enter squire's training, and one day become a full noble knight, just like his father had been. Standing outside the castle grounds of the squire taskmaster that sweltering evening, he wasn't feeling very noble. As he waited to be admitted, a lead-faced sentry glowered down at him and his ragged haversack. Max put on his bravest face, and stared right back. But he could feel streams of cold sweat rolling down his cheeks. 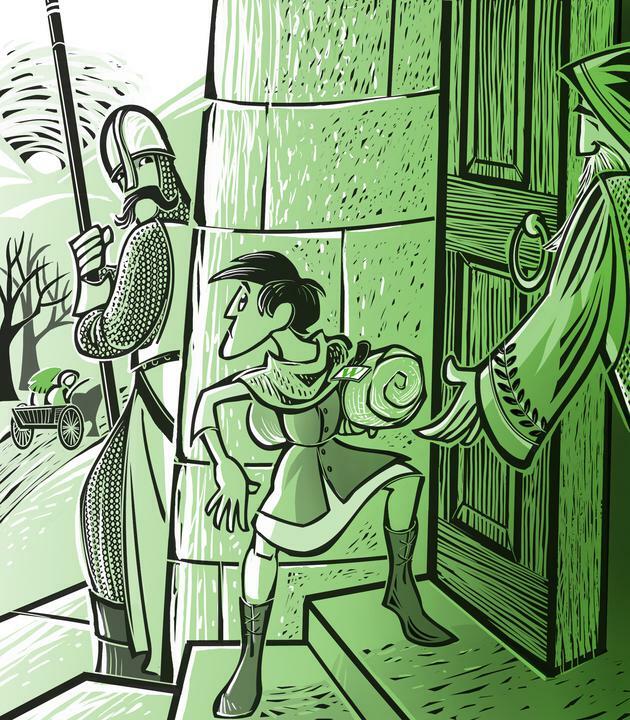 He had heard squires' harrowing tales of how Ballfort, their stern and immutable taskmaster, relished molding doughy-eyed moppets into starched young men fit for the rigors of serving a knight . . .
“A 'wet-nosed pup'—Gawl!” Max blurted indignantly, then looked around only to see a hoary and stoop-shouldered old man hunched in the doorway. This door man hauled him in and ushered him down the hallway with a staff, just like a goat. Before the door slammed shut behind him, Max thought he saw the sentry grinning.